At long last, we have a day of full turquoise skies. It seems as though it’s been a long time coming, this feeling of full spring, although in truth it has only been a matter of days since the last warm spell. But the further calendric winter recedes from view, the longer and more invasive the cold and snow seem when they return. And we did get snow yesterday — flurries only, of course, and mostly mixed with sleet, but it was sufficient to leave an icy white rime on every surface this morning. Now, at sunny midday, the snow is gone, leaving only green grass and the white of aspen pollen in its wake. It feels as though we have been granted not so much a reprieve as an opportunity: a season of meadowlark’s call and pollinating skies, if only we seize it before it has a chance to vanish yet again. Those skies turned blue this morning on the distinctive notes of the meadowlark’s song, as nearly always, out of sight but not out of range of sound. More of the small birds have arrived; two days ago, I noticed outside a downstairs window either siskins or warblers, their movement far too fast for me to get a clear view. Perhaps our lonely hummingbird of two weeks ago will return . . . and bring others of its clan, here in search of early nectar. Perhaps the blue skies of spring have arrived at last, on the song of the meadowlark and the beat of a hummingbird’s wings. Hummingbirds are tiny messengers of the spirits, tasked with spreading nectar upon the winds, pollinating sky in the summer light. Wings summons one of these small emissaries into being with his newest pin, one that assumes Hummingbird’s form and shape. 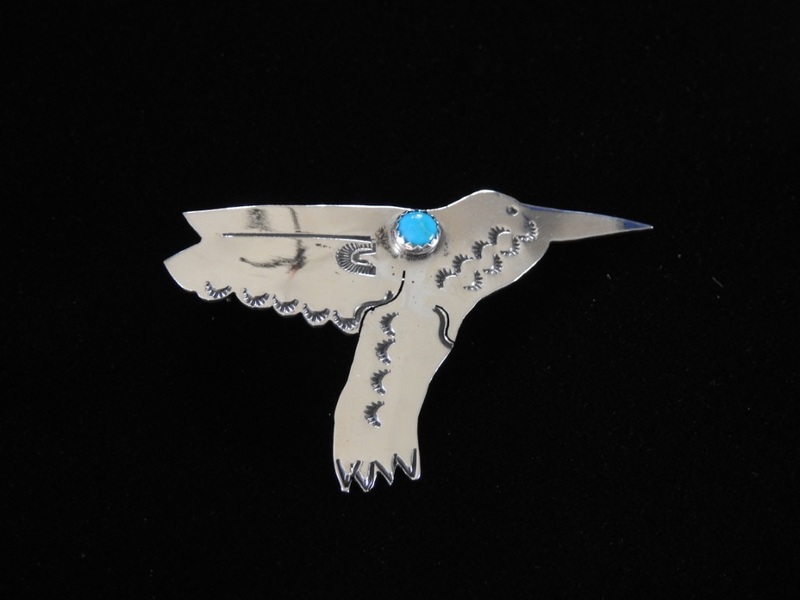 Cut freehand from sterling silver, caught in hovering flight, her wings are scalloped with sunrise symbols, her tailfeathers articulated by way of arrowhead points. Seen in profile, her eye is a tiny hoop, wings separated and body and yoke defined by hand-chiseled lines. Additional hand-stamped symbols of ethereal radiance accent throat, wings, and body. Where neck meets wings, she carries a single piece of sky, an impossibly clear, electric blue turquoise cabochon set into a saw-toothed bezel. Pin is 1.5″ high by 2.25″ across at the widest point; cabochon is 3/16″ across. There are winds forecast for later; rain and snow midweek, too. For this moment, though, the air is warming, the breeze gentle, the skies bright blue, and the world filled with the sound of birdsong. There is life outside the window, and growth, and a flowering of light. These moments are perhaps only a respite, but a much-needed one, a few minutes of peace before the pressures of the week begin anew. And while we listen to the soothing sound of the meadowlark, we keep one ear open for the arrival of the hummingbirds. Posted on Sunday, April 14th, 2019 at 12:24 pm. Filed under: The NDN Silver Blog Tags: The NDN Silver Blog	RSS 2.0 feed.